The Oteo Missouria Tribe has razed three homes in an east Perry neighborhood to build a casino and parking lot. PERRY — The house, crouching in the middle of a neighborhood in east Perry, sat unoccupied for years. Its shingles were rotted, and its metal porch railing was bent. Weeds and brush rose from the foundation past gaping, empty windows. Last year, city officials notified the owners that they needed to clean up the property. The city wasn’t prepared for the counteroffer. The Otoe-Missouria Tribe, which oversees the property, held in federal trust, proposed instead to raze the home and build a casino. The news shocked many in this north-central Oklahoma community of 5,500. A casino, in the middle of a neighborhood, despite zoning laws and the lot’s proximity to churches and a park? About 15 people spoke at a Nov. 17 council meeting, most in opposition. A local Ministerial Alliance objected to the casino. After doing research, city officials decided not to fight the proposal in court, believing they couldn’t win. And so, recently, the tribe tore down the house at 1106 N. 6th Street, as well as razed two homes to the south that it had bought to create a parking lot. The 4,500-sq.-ft. casino is expected to open this summer, tribal officials said. Jim Franklin, a member of the Perry Planning Commission, said most residents are now resigned to the casino. Controversy over locating tribal casinos in Oklahoma is not new. In Broken Arrow, thousands of residents have resisted a plan in recent years to build a casino located near homes and schools. But the Perry casino, to be wedged among modest white-frame and stone homes, throws the issue into sharp relief. The plan raises questions about what limitations, if any, Native American tribes have when deciding to build a casino or other facilities in the middle of Oklahoma cities or towns. Native American lands can be held in fee – that is, by purchase – or in trust. Federal code defines trust lands as areas whose title “is held by the United States in trust for an Indian tribe or individual.” Some tribal lands were allotted through the Dawes Allotment Act of 1887, in which 160-acre lots were issued and have since been subdivided through inheritances. Tribes can purchase property anywhere and pay taxes and abide by laws that apply to all property owners. To put land in trust, tribes must apply to the U.S. Bureau of Indian Affairs and, if plans for the land involve gaming, must meet rules set forth in the Indian Gaming Regulatory Act. In either case, the federal government would consider whether the land is within or next to the tribe’s existing or historical jurisdiction. Applications involving gaming would get close scrutiny. In the case of the house in Perry, the property is held in trust for the sole use of the Otoe-Missouria Tribe, a domestic sovereign nation whose jurisdiction encompasses Perry. Thus, a casino can be built legally on the property. Lands held in fee or trust are exempt from state and local mandates, so zoning laws don’t apply. Land in trust also can’t easily be sold, which further prompted Perry to negotiate with the tribe. Tribal Chairman John Shotton said in an email that the trust land in Perry was given to tribal members in the days when Oklahoma was Indian Territory, and then was handed down over generations. “The land was held in trust status for an individual Otoe-Missouri tribal member. The tribe purchased a majority interest in the property from the heirs of the original owner. The land was and continues to be held in trust status by the federal government under the jurisdiction of the Otoe-Missouria Tribe. The status has never changed, just the ownership,” Shotton said. City Manager Mary Rupp said although some Perry residents are upset, others don’t care because they don’t patronize casinos and say they won’t be affected. Shotton said the issue isn’t new to many native peoples. The tribe and Perry have set out the terms for the project and cooperation between them. The agreement provides for a $250,000 payment in lieu of taxes from the Otoe-Missouria Tribe upon opening the casino, Rupp said. In each succeeding year, the tribe will pay $30,000 to the city “to help offset additional public services we many have to provide, such as law enforcement, fire and ambulance services,” Rupp said. The number of trust or tribally owned properties in cities or towns can vary widely. A check of property records in Tulsa County, which falls within the Muscogee (Creek) Nation and Cherokee Nation jurisdictions, found more than 200 properties owned by the Muscogee (Creek) and up to about 20 owned by the Cherokee. County officials said they didn’t know how many have trust designation. Oklahoma City lies outside of any tribe’s jurisdiction. But even there, several properties show ownership as “Cherokee Nation Trust” and other tribes’ names. Some are near or within residential zones, including one just north of State Fair Park. Even if a tribe has the right to build a casino in or near a neighborhood, other barriers can arise. One is whether a casino in a neighborhood would attract much business. (The Perry casino’s parking lot would abut a street that is part of State Highway 77.) Another is whether the project would draw such heated opposition that it wouldn’t be worth the trouble and cost. 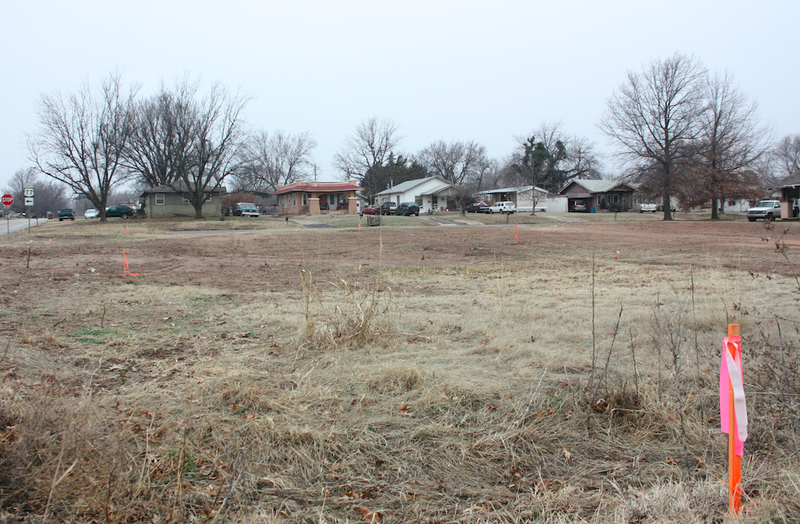 In Perry, the tribe has yet to apply to the Planning Commission for permission to turn two of the vacant lots into a parking lot. A city representative said there is no timetable on that expected move. Which store in your area sells the most Lottery tickets? Which cities record the most sales? Find the answers in this interactive table.